These days, Angelina Jolie is known as much for her activism as for her acting, and she has had a long connection with Cambodia. Parts of the "Tomb Raider" franchise were filmed in the country’s ancient temples, Jolie and husband Brad Pitt adopted a Cambodian orphan, and she has poured millions into development and conservation projects in the country. She was even granted honorary Cambodian citizenship in recognition of her contributions. Whether you think Jolie's charitable efforts are genuine or merely a way to bolster her image, you have to admit that she has done a lot to bring a once-forgotten country into the spotlight. Now, Jolie will head to what is arguably the most popular tourist attraction in all of Southeast Asia to film her latest project, a film version of writer Loung Ung’s memoir, "First They Killed My Father." The film, which reportedly will feature Jolie's adopted Khmer son in a prominent role, will skip theaters and head straight to Netflix. Much of the filming will take place in Siem Reap Province, where the famous Angkor Wat temple complex is located. Some scenes will reportedly be shot in the temple ruins, while others will take place in the rice fields and river banks in the surrounding areas. According to the Cambodian Film Commission, the production will move relatively quickly. The first scenes will be filmed in early November, and the plan is to wrap by the end of January. Battambang, Cambodia’s second largest city after Phnom Penh, will be used for about 10 percent of the movie. On one level, Jolie’s Cambodian-based films are good for the tourism industry here. "Tomb Raider" was the first major production to be shot in the country since Peter O’Toole starred in "Lord Jim" in the 1960s. 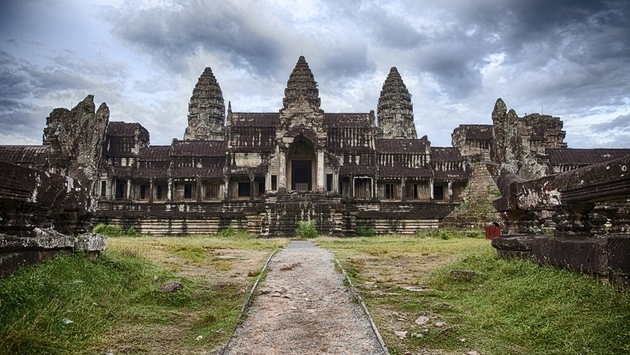 There is concern, however, that the now-booming tourist trade in and around Angkor Wat will be put on pause to make way for the production crew and cast. There are plans to block off certain roads and sections of the temple grounds so that oblivious tourists and gawkers don’t interrupt the filming. The movie, about one family's experience under the brutal Khmer Rouge regime, will cover very tragic events. However, it will also be a chance for people to see the idyllic countryside around Siem Reap. While Angkor is extremely well known (it was a popular destination even before "Tomb Raider" hit screens), the rural areas around the temples are rarely visited, and Battambang is also off the tourist map despite being the country’s second largest city. One of the better movies shot in Cambodia since the turn of the millennium was an indie offering by Matt Dillon called "City of Ghosts." The movie featured the capital city of Phnom Penh, the famous casino/hotel ruins of the Bokor Hill Station, the chilled-out beach town of Kep and the temples of Phnom Chisor, which are right near Phnom Penh and actually pre-date most of the ruins at Angkor. (Ghosts also gives viewers a chance to see James Caan singing karaoke in Khmer). Netflix subscribers will get to see Jolie's version of provincial Cambodia sometime next year. Loung Ung's book was published by Harper Collins in 2000 and is still widely available.